The gold market is very interesting because it consists of a very limited number of people who are “gold bugs” as they call them. And these are people that will accumulate gold, physical gold and gold shares and so forth, but this is the minority. And then there are the gold detractors. These are mostly fund managers and so-called central bankers. And central bankers are not particularly smart. And then there are people who simply haven’t heard about gold as an investment… and don’t forget that in the U.S. 50 percent of the people have no interest in investments for the simple reason that they have no money. You could show them any proposal for an investment, they wouldn’t be interested because they have not the money to invest in the first place. But in general I think that people will gradually wake up to the fact that in absence of knowing how the world will look like in five or ten years, you need some diversification and in this environment, I think that some people will say “well, let’s own some gold.” Most people will only own five or ten percent but some people will own 20 percent and I think that if the whole world decides to own, just say three percent or five percent, and the fund managers who are very anti gold see gold prices running up again… the whole investment business has become a momentum game….. so if they see that gold is moving up in a convincing way they’ll buy gold. 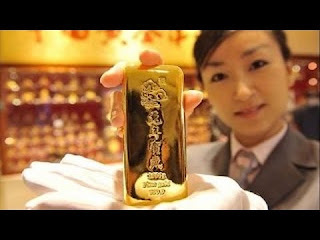 So, my sense is that you need some gold strength and then people will come in and buy gold simply because it moves up. I buy gold all the time, of course within my asset allocation. I also have shares and bonds and real estate, but I always buy some gold to maintain the proper weighting.